Pangaea was formed by the convergence of multiple continental masses, including an early version of Gondwana; it later broke apart, beginning in the late Triassic to form two primary continents, Laurasia and Gondwana. Gondwana (originally Gondwanaland) is an hypothesized ancient southern supercontinent comprising most of the landmasses in today's southern hemisphere, including Antarctica, South America, Africa, Madagascar, Australia-New Guinea and New Zealand, as well as Arabia and the Indian subcontinent, which are in the Northern Hemisphere. Gondwana is thought to have formed roughly 510 million years ago and to have lasted until about 150 million years ago. During its long span of existence, Gondwana, through movements that would have been imperceptibly slow to the unaided human senses, merged with a northern hemispheric land mass, Laurasia, to form the supercontinent Pangaea, until the two masses gradually parted again. That is, Gondwana existed both before the supercontinent Pangaea formed near the end of the Paleozoic era (roughly 350 to 260 million years ago), and it remained together, with some changes, after Pangaea broke up during the Triassic and Jurassic periods of the Mesozoic (with this rifting beginning about 208 million years ago). Gondwana itself began to break up in the mid to late Jurassic period about 150 million years ago. 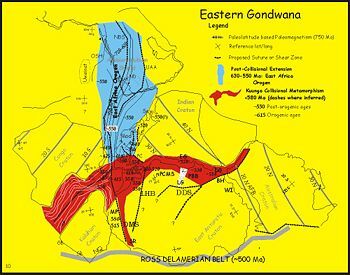 The continent was named after the Gondwana region of India, and literally means "Land (wana) of the Gonds." Gondwana sedimentary sequences (Permian-Triassic) are also described from the India section. The name was suggested in 1872 by Medlicott of the Geological Survey of India (de Wit et al. 1999, Medlicott 1879), and the concept was advanced by Austrian geologist Eduard Suess and later German scientist Alfred Wegener. Mapping the appearance, movement, transformation, and disappearance of continental land masses through the eons of earth history must be credited as one of the great achievements in the human quest for knowledge. That effort has taxed the full measure of human capacities requiring tremendous imagination just to visualize the spans of time involved. Substantiating that visualization has demanded uncountable hours and days of field studies and laboratory research around the world, including the study of rock formations, ocean sediments, fossil forms, mines, glaciation patterns, and climate patterns. Computers have played a major role in analyzing and assembling the diverse data. The task is still far from finished, leaving ample opportunity for newcomers to make important contributions to understanding the history of Gondwana and Earth's continents. Plate tectonics is a theory of geology that was developed to explain the observed evidence for large scale motions within the Earth's crust, such as the formation and breakup of Gondwana, leading to our current configuration of continents. Essentially, this theory recognizes a thin, solid crust, made up of several plates, that floats or rides on an inner layer of melted rock. Specifically, the outermost part of the Earth's interior is made up of two layers: above is the lithosphere, comprising the crust and the rigid uppermost part of the mantle. Below the lithosphere lies the asthenosphere, which is a more viscous zone of the mantle. Although solid, the asthenosphere has very low shear strength and can flow like a liquid on geological time scales. The deeper mantle below the asthenosphere is more rigid again. The lithosphere essentially floats on the asthenosphere and is broken up into what are called tectonic plates—in the case of Earth, there are ten major and many minor plates. These plates move in relation to one another, and thus the formation and later rifting of Gondwana. The assembly of Gondwana was a protracted process. Several orogenies (mountain building, tectonic events) led to its final amalgamation 550–500 million years ago in the Cambrian. These include the Brasiliano Orogen, the East African Orogen, and Kuungan Orogen. The final stages of Gondwana assembly overlapped with the opening of the Iapetus Ocean between Laurentia and western Gondwana. During this interval the Cambrian explosion occurred. During the Carboniferous, Gondwana collided with other large continental masses, including the cores of North America (Canadian Shield or Laurentia), Europe (Baltica), and Siberia, to form the supercontinent Pangaea by Permian time. One detailed description for this process can be found in the discussion of Formation of Pangaea. When Pangaea broke up, beginning in the Triassic but mostly in the Jurassic, two large masses, Gondwana and Laurasia, were formed. The supercontinent Laurasia essentially consisted of the minor supercontinent Laurussia (or Euramerica) and the continent Siberia. When Pangaea broke up, the re-formed Gondwana continent was not precisely the same as before Pangaea formed; for example, most of what is now Florida and southern Georgia (U.S. state) and Alabama are underlain by rocks that were originally part of Gondwana but that were left attached to North America when Pangaea broke apart. 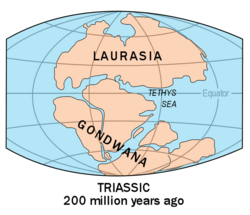 Gondwana began to break up in the mid- to late Jurassic (about 167 million years ago) when East Gondwana, comprising Antarctica-Madagascar-India-Australia, began to separate from Africa during the Middle Jurassic. South America began to drift slowly westward from Africa as the South Atlantic Ocean opened, beginning about 130 million years ago (Early Cretaceous) and resulting in open marine conditions by 110 million years ago. East Gondwana itself began to be dismembered as India began to move northward, in the Early Cretaceous (about 120 million years ago). India was further broken into the Madagascar block and a narrow remnant microcontinent presently occupied by the Seychelles Islands; elements of this breakup are nearly coincident with the Cretaceous-Tertiary extinction event that wiped out about 50 percent of all species on the planet, most notably the dinosaurs, 65 million years ago. The India-Madagascar-Seychelles separations appear to coincide with the eruption of the Deccan basalts, perhaps an expression of the initiation of the Réunion hotspot. Australia began to separate from Antarctica perhaps as long ago as 80 million years (Late Cretaceous), but sea-floor spreading between them became most active about 40 million years ago during the Eocene epoch of the Tertiary Period. New Zealand probably separated from Antarctica between 130 and 85 million years ago. As the age of mammals got underway, the continent of Australia-New Guinea began to gradually separate and move north (55 million years ago), rotating about its axis to begin with, and thus retaining some connection with the remainder of Gondwana for about 10 million years. About 45 million years ago, the India Plate collided with Asia, buckling the crust and forming the Himalayas. At about the same time, the southernmost part of Australia (modern Tasmania) finally separated from Antarctica, letting ocean currents flow between the two continents for the first time. This produced cooler and drier climates on the two continents, because the ocean current flowing round Antarctica, which was no longer pushed into the sub-tropics, could flow north of Australia. Another significant world climatic event was South America separating from West Antarctica sometime during the Oligocene, perhaps 30 million years ago. Immediately before this, South America and East Antarctica were not connected directly, but the many microplates of the Antarctic Peninsula remained near southern South America acted as "stepping stones" allowing continued biological interchange and stopping oceanic current circulation. But when Drake Passage opened, there was now no barrier to force the cold waters of the Southern Ocean north, to be exchanged with warmer tropical water. Instead, a cold circumpolar current developed and Antarctica became what it is today: a frigid continent that locks up much of the world's fresh water as ice. Sea temperatures dropped by almost 10 °C, and the global climate became much colder. By about 15 million years ago, the collision between New Guinea (the leading edge of the Australian Plate) and the southwestern part of the Pacific Plate pushed up high mountains, forming the Papua New Guinea Highlands. The mountain-building events in New Guinea would drastically change the weather patterns in Australia, creating a rain-shadow that led to Australia drying out. Later, South America became joined to North America via the Isthmus of Panama. This cut off circulation of warm water, creating the Arctic. The Red Sea and East African Rift are modern expressions of the continuing dismemberment of Gondwana. 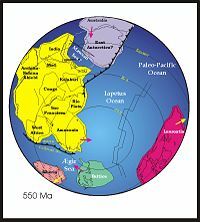 During the late Paleozoic, Gondwana extended from a point at or near the South Pole to near the equator. Across much of the supercontinent, the climate was mild, which contributed to the formation of the late Paleozoic Gondwana sedimentary sequence that is the source of much of the mined coal. During the Mesozoic, the world was on average considerably warmer than today. Gondwana was then host to a huge variety of flora and fauna for many millions of years. But there is strong evidence of glaciation during Carboniferous to Permian time, especially in South Africa. DeWit, M., M. Jeffrey, H. Bergh, and L. Nicolaysen. 1999. “Gondwana reconstruction and dispersion.” Search and Discovery Article 30001. American Assoc. of Petroleum Geologists. König, M., and W. Jokat. 2006. “The Mesozoic breakup of the Weddell Sea.” Journal of Geophysical Research. Retrieved June 15, 2007. Medlicott, H. B., and W. T. Blandford. 1879. A Manual of the Geology of India. Calcutta: Geol. Survey, India. Meert, J. G. 2003. “A synopsis of events related to the assembly of eastern Gondwana.” Tectonphysics 362: 1-40. Scheffler, K., S. Hoernes, and L. Schwark. 2003. “Global changes during Carboniferous–Permian glaciation of Gondwana: Linking polar and equatorial climate evolution by geochemical proxies.” Geological Scocity of America. Retrieved June 15, 2007. This page was last modified on 26 June 2017, at 14:10.